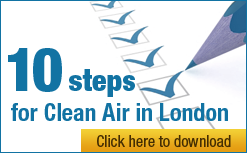 If you care about the serious health impact of air pollution, please email David Miliband on [email protected] and Ken Livingstone on [email protected] emphasising your local air pollution concerns and that you want World Health Organisation recommended levels of air quality to be achieved urgently in London. Once the political will exists to tackle air pollution, practical ways of addressing it will be found (as they were in the past for sulphur dioxide, leaded petrol and the ozone layer). It is that simple. Earlier today, all six MEPs representing London at the vote on the European Parliament’s (EP) first reading of a new European Union (EU) Directive on Air Pollution rejected unanimously calls for unnecessary postponements of European Union (EU) air quality limits. In an outstanding display of concern for Londoners, these MEPs stood up against their European political party allies to oppose these delays. One London MEP, John Bowis (Conservative), went so far as to vote against the offending amendments even though he was the official “Co- ordinator” of a session! It is vital that David Miliband, as Secretary of State for the Department for Environment, Food and Rural Affairs (Defra), supports London’s MEPs at the European Council meeting scheduled for 23 October by rejecting also the amendments that were proposed today by the European Parliament and insisting on a second reading of the draft EU Directive (which is likely then to take place in March or April 2007). For Londoners, the position is very simple. Of course, we want the “input” of a robust legal EU Directive to protect us, but the key is the “output” of meeting World Health Organisation recommended levels of air quality by January 2010 (and earlier for particulate matter). These deadlines were signed up to by the EU and the UK as far back as 1999 and there is no excuse for the late postponement of them. PM10 causes premature death and NO2, which is a toxic gas with its concentrations often strongly correlated with other toxic pollutants, is associated with lung diseases and an increase in allergic reactions. Furthermore, NO2 is known for its adverse health effects on children even when the overall level is low. Finally, with strong support from London’s MEPs (Conservative, Green, Independence and Liberal Democrat) now added to that from Angie Bray and Mark Field (Conservative AM and MP respectively) and Darren Johnson (Green GLA), we urge the UK authorities to listen and take urgent action to address serious air pollution problems in Central London. At the European Parliament session on 26 September, MEPs voted in respect of the first reading of a new EU Directive on Air Pollution by a large majority, of 413 to 178, to propose (assuming the Directive comes into legal effect in Spring 2007) the deadline for complying with legal limits for particulate matter being extended from January 2005 to January 2014 and for nitrogen dioxide (narrowly by 322 to 298) being extended from January 2010 to January 2014. The former would be subject to some conditions whereas the latter would be a “free lunch”. HM Government’s advice to UK MEPs was that the deadlines should not be postponed for particulate matter beyond January 2011 and for NO2 beyond January 2014 but in both cases should only be allowed subject to clearly defined conditions (i.e. no “free lunch”). This timetable is likely to be rejected by the European Council of Ministers and come back to a second reading and vote of the EP in Spring 2007.